WEST POINT, N.Y. (AP) — Army quarterback Kelvin Hopkins Jr. has a different mindset, one that bodes well for the Black Knights. A year ago Hopkins knew he wasn’t going to see much playing time under center because Ahmad Bradshaw was having a stellar senior season. Now Hopkins is the lead man and things have changed. Five games into the season, Hopkins has demonstrated he’s up for the challenge of leading Army’s triple option. He has quickly matured in his new role as the Black Knights (3-2) chase a third straight bowl game appearance. Army’s lone losses have come on the road against teams that have been ranked this fall — Duke in the season opener and Oklahoma, which needed overtime to win. The Black Knights earned a boatload of respect in that one three weeks ago and received a standing ovation from the partisan crowd after the game. Ball security is emphasized by the coaching staff at West Point because it’s a key to success. The Army offense lost only four fumbles last season and matched an academy record with 10 wins, so there was dismay when Hopkins and the offense got off to a shaky start at Duke, losing two of five fumbles in a 34-14 loss. In nearly 300 snaps since, the offense hasn’t fumbled and Hopkins has excelled. He has 397 yards rushing to lead an attack that’s averaging 308 on the ground, third nationally, and leads the nation in time of possession, averaging just over 40 minutes. Against Oklahoma , the Black Knights had the ball for 44:41 and ran 87 plays to 40 for the then-No. 5 Sooners, the third-fewest offensive plays for Oklahoma in school history and the fewest since 1960. What’s different about Army this year is that Hopkins has made the Black Knights more of a threat through the air. He’s 25-of-51 passing for 551 yards and three TDs with three interceptions. In 13 games last year, Army finished with 361 passing yards, attempting only 65 passes and suffering six interceptions to rank last nationally. Hopkins offered a glimpse of his potential as a sophomore, etching his name in academy lore by rallying the Black Knights to an improbable win over Temple at Michie Stadium. Army trailed by seven points with 91 seconds remaining in the fourth quarter when Monken replaced Bradshaw with Hopkins, and Hopkins guided the Black Knights on a 14-play, 79-yard scoring drive that included five completions for 67 yards. The last completion was a perfectly thrown 16-yarder to Jermaine Adams in the left corner of the end zone with one second left in regulation, and Blake Wilson kicked a short field goal in the first overtime for a dramatic 31-28 victory. Army entered that game averaging 17.9 yards passing per game, and Hopkins was 1 for 6 for nine yards and one interception before he was inserted. 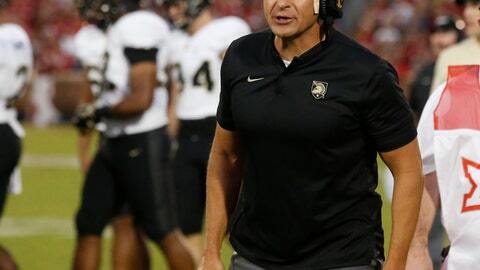 “To step into that situation where we had to get a score to win and to have him lead us down the field like he did certainly helped his process of maturing and his confidence,” said Monken, in his fifth season at West Point. “That is so much a part of being a leader on the team and being the quarterback. Coming off a bye week, Army plays at winless San Jose State on Saturday. The Black Knights are brimming with confidence after a dominant 42-13 road win over previously unbeaten Buffalo of the Mid-American Conference. The victory, after the tough loss to the Sooners, gave Army a winning record through five games for the third straight season, the first time that’s happened since 1986.